Yep. That's the easiest way to do it. Great. As it was going through the SFC procedure (that's the part where it wanted the disk) did it find any files that needed restored? I'm not sure. I put it running and left for work. C: is FIXED (NTFS) - 223 GiB total, 28.982 GiB free. D: is FIXED (NTFS) - 10 GiB total, 6.007 GiB free. G: is FIXED (NTFS) - 1863 GiB total, 1669.267 GiB free. 2/3/2014 1:55:45 PM, error: Service Control Manager  - The NVIDIA Display Driver Service service terminated unexpectedly. It has done this 1 time(s). 2/1/2014 4:06:23 AM, error: Windows Update Agent  - Installation Failure: Windows failed to install the following update with error 0x80070643: Update for Outlook 2003 Junk E-mail Filter (KB2863822). 2/1/2014 4:06:23 AM, error: Windows Update Agent  - Installation Failure: Windows failed to install the following update with error 0x80070643: Update for Office 2003 (KB907417). 2/1/2014 4:04:16 AM, error: Windows Update Agent  - Installation Failure: Windows failed to install the following update with error 0x80070643: Update for Microsoft Security Essentials - 4.4.304.0 (KB2902885). 2/1/2014 4:01:03 AM, error: Windows Update Agent  - Installation Failure: Windows failed to install the following update with error 0x80070643: Office 2003 Service Pack 3 (SP3). 2/1/2014 3:21:08 PM, error: sptd  - Driver detected an internal error in its data structures for . 1/31/2014 7:19:37 PM, error: Service Control Manager  - The Process creation detector. 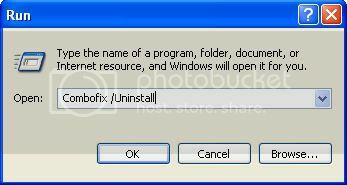 service failed to start due to the following error: The system cannot find the file specified. 1/31/2014 7:19:23 PM, error: Print  - Printer Microsoft Office Document Image Writer failed to initialize because a suitable Microsoft Office Document Image Writer Driver driver could not be found. 1/31/2014 7:17:00 PM, error: Service Control Manager  - The Windows Firewall/Internet Connection Sharing (ICS) service terminated with the following error: Access is denied. 1/31/2014 6:21:39 AM, error: Service Control Manager  - The Service Control Manager tried to take a corrective action (Restart the service) after the unexpected termination of the Windows Management Instrumentation service, but this action failed with the following error: An instance of the service is already running. 1/31/2014 4:12:32 AM, error: Microsoft Antimalware  - Microsoft Antimalware has encountered an error trying to update signatures. New Signature Version: Previous Signature Version: 1.165.2960.0 Update Source: Microsoft Update Server Update Stage: Install Source Path: http://www.microsoft.com Signature Type: AntiVirus Update Type: Full User: NT AUTHORITY\SYSTEM Current Engine Version: Previous Engine Version: 1.1.10201.0 Error code: 0x80240016 Error description: An unexpected problem occurred while checking for updates. For information on installing or troubleshooting updates, see Help and Support. 1/31/2014 4:12:32 AM, error: Microsoft Antimalware  - Microsoft Antimalware has encountered an error trying to update signatures. New Signature Version: Previous Signature Version: 1.165.2960.0 Update Source: Microsoft Update Server Update Stage: Download Source Path: http://www.microsoft.com Signature Type: AntiVirus Update Type: Full User: NT AUTHORITY\SYSTEM Current Engine Version: Previous Engine Version: 1.1.10201.0 Error code: 0x80240016 Error description: An unexpected problem occurred while checking for updates. For information on installing or troubleshooting updates, see Help and Support. I believe things are OK now... let's run a double check. Please download MBRCheck.exe to your desktop. Please post the contents of that file. not sure if this is an unknown bootcode or not?? Nope. 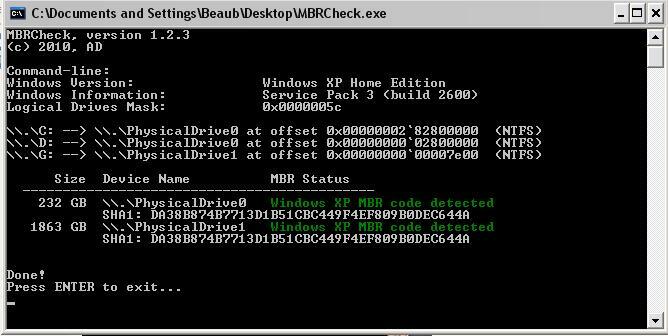 It appears to me to say "Windows XP MBR code detected"... which is a good thing. I don't know why gmer's tool keeps saying there might be a MBR problem with ntkrnlpa.exem but it seems to check out fine. How are things running now? If you haven't done so, give it a test drive and then let me know. I think we are finally ready to clean you up and let you get back to your regularly scheduled life. If you have any tools or logs left... just delete them. I happen to put in a thumb drive to see if that issue was fixed, and nothing. No detection that it is there??? After reboot, let me know if it can now see your thumb drive.